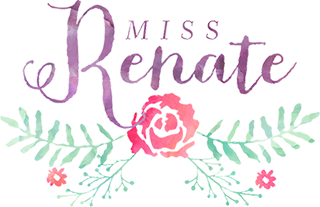 Miss Renate belongs to Renate Dapperen, all the texts and photographs belongs to Renate Dapperen unless indicated. Failure to respect copyright laws will not be accepted and will be dealt with accordingly. It is not allowed to use the texts, photographs, video, illustrations or anything else on this website without approval. If you want to use anything on this blog, you can send an e-mail asking for permission, if permission is granted you will be allowed to use the content of this blog as long as you disclaim your source. The products seen on Miss Renate are mostly purchased by myself (Renate Dapperen). The articles about products I get from companies are written with as much honesty as those I write about the products I purchased myself. You will see the euro (€) sign below the articles if I have been paid by a company or if the products have been sent to me. No matter what, honesty is the most important to me and I always do the best I can to make these articles as pleasant to read as the articles I don’t get monetary compensation for. As for the rest, I am not responsible if my articles contain imperfections or omissions. It’s human to make mistakes or give the wrong information about something, if you notice such mistake let me know so I can correct it. By visiting MissRenate.com you agree with this disclaimer.